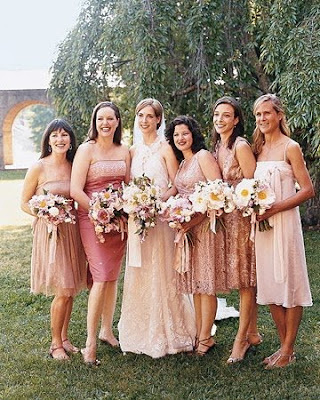 A new and exciting discovery made by brides everywhere is that you don't in fact have to make your bridesmaids completely match in the same bridaly (ahem, ugly!) dresses you choose at the local bridal store. Bridesmaids are rejoicing worldwide, hooorraay! I finally made my decision about what my girls will be wearing the other night but before I reveal that, I want to do a post on how fun I think it is to let the girls choose their own dresses in a color you pick for them. 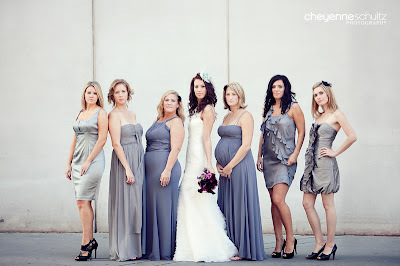 The look is so neat and I think you get happier bridesmaids and a more visually appealing look for your wedding (since the girls really set the tone for the scene!). I just think this look was so well put together. The picture is amazing with all the women who are different sizes and shapes and in the different cut/styles and varying shades of the same color. A+ my friends. So romantic with all those pretty shades of pink! I absolutely adore this. First of all, I tend to think bride/bridesmaid pictures look better when there are fewer bridesmaids because you can really see each of the women and what their individual looks are easier. This photo is so well balanced and the overall look is perfect. I'm jealous that those aren't my colors. And this is my absolute favorite. Perhaps it's because I am drawn to off white/champagne colored dresses for bridesmaids and the fact that two of the girls are in lace is definitely helping their case, but I LOVE this look. 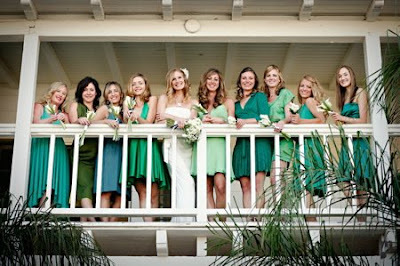 I would be thrilled to have my wedding party attire look like this!